“Second river crossing”? We already have six seven. 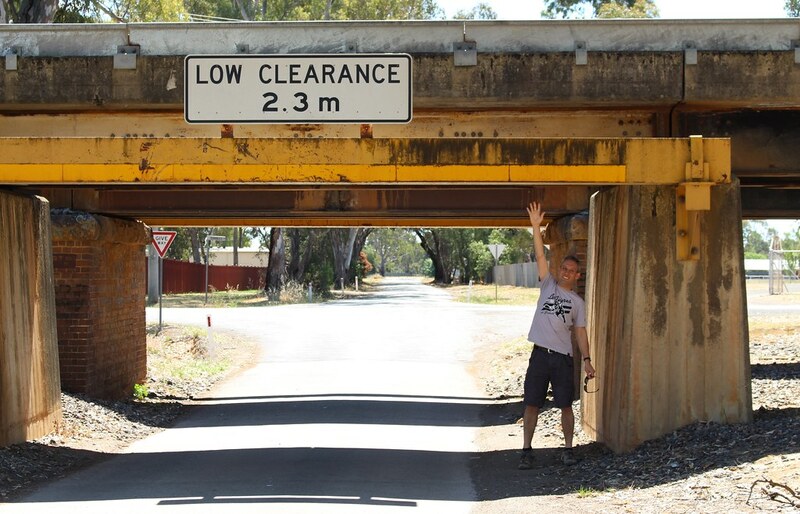 A lot of the talk around the need for a new east-west motorway claims we need a second river crossing. The issue with this claim is that we already have a second river crossing. The first river crossing is, of course, the Westgate bridge — recently-upgraded (25% boost in capacity as part of a $1.4 billion project) but still full (thank you induced traffic) — 5 lanes each way. 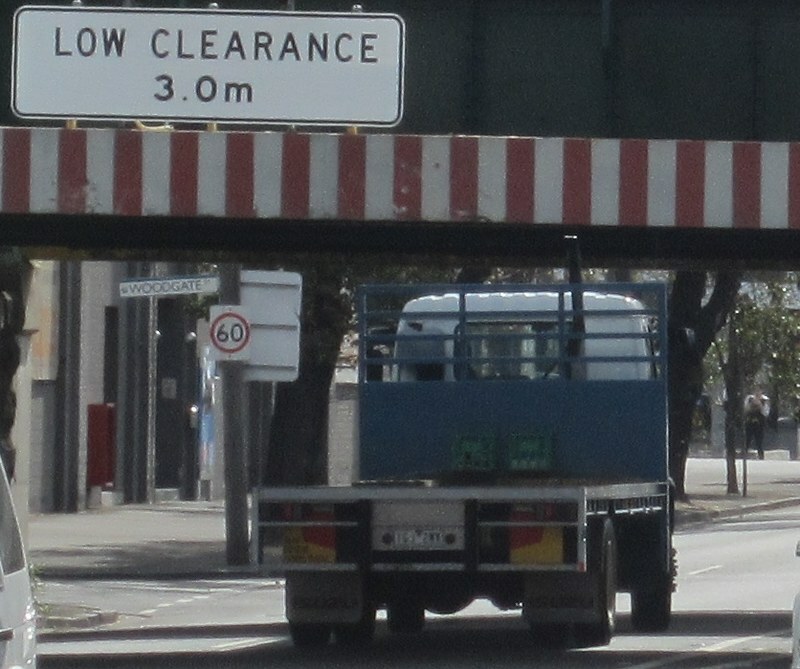 The second river crossing is Footscray Road. 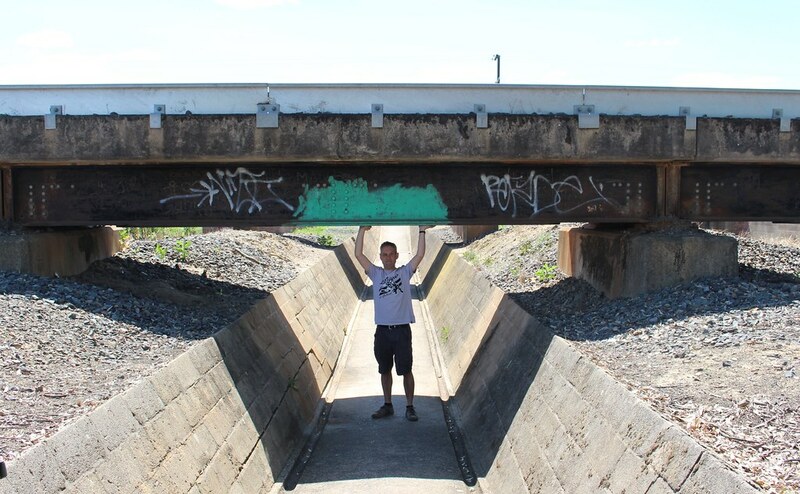 This is three lanes each way for most of its length, but where it crosses the Maribyrnong River, 2 lanes each way. 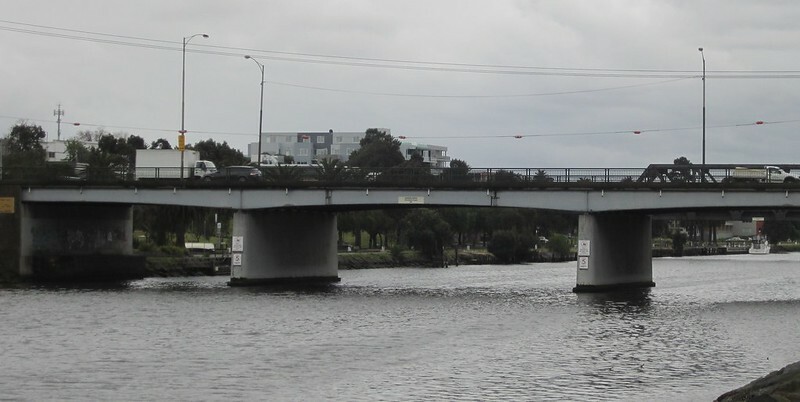 The third river crossing is Dynon Road, with 2 lanes each way. 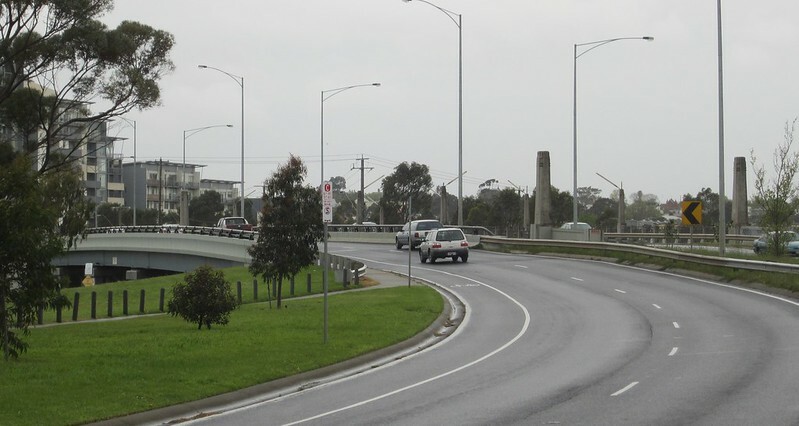 The fourth river crossing is Smithfield Road/Ballarat Road, also with 2 lanes each way. 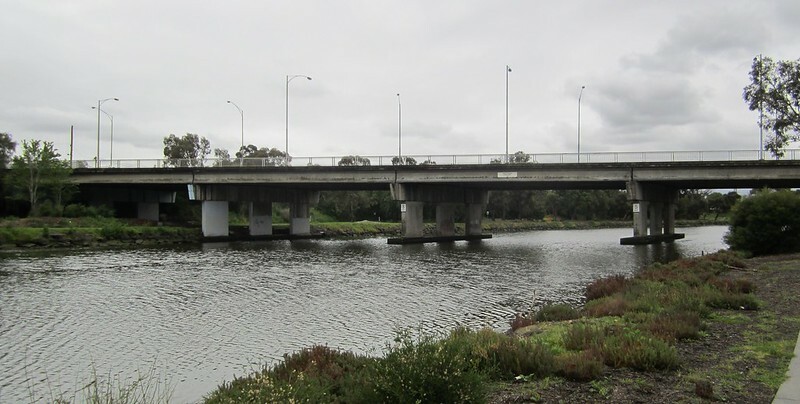 So while the call is for a second river crossing, in fact the existing second, third and fourth river crossings already together provide more lanes than the Westgate Bridge. It’s true that none of these are motorways, and therefore they have traffic lights, but this hardly matters at peak times, when traffic clogs up and crawls whether or not a road has traffic lights. 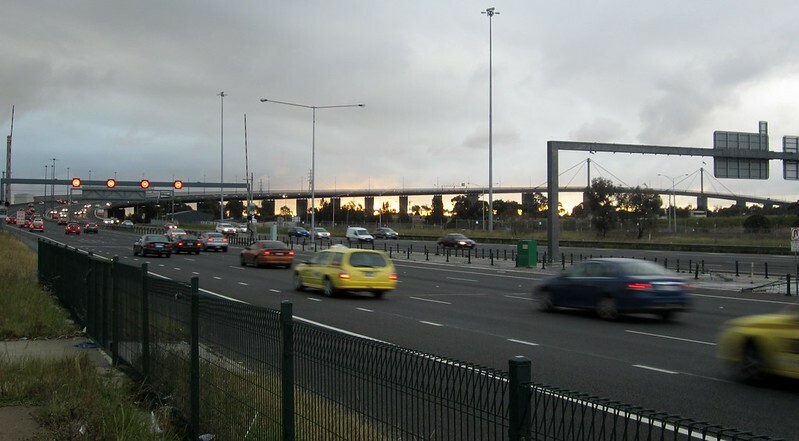 Vehicle lanes have a theoretical capacity of between 1300 and 1800 vehicles per hour, and the latest Vicroads network performance monitoring report says that the average car occupancy during peak hour in Melbourne is 1.21 (PM peak; AM is lower). If one assumed the top of the range, that’d be a theoretical 2,178 people per lane per hour. So for the 5 lanes each way on the Westgate plus 6 lanes each way on the other roads we’ll say they’re taking a load of up to about 23,950 people per hour. (A little further north, but arguably outside the area of where the new motorway is wanted, are Farnsworth Avenue and Maribyrnong Road — adding a further 3 lanes each way). There are more river crossings than just the roads. 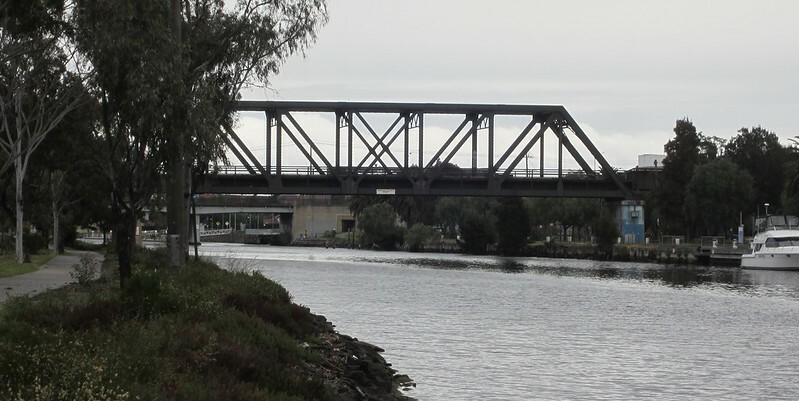 The fifth river crossing is the four track railway line from Footscray, serving suburban and regional trains from Williamstown, Werribee (including Altona Loop), Sydenham, Geelong, Melton/Ballarat and Bendigo — 2 tracks each way. 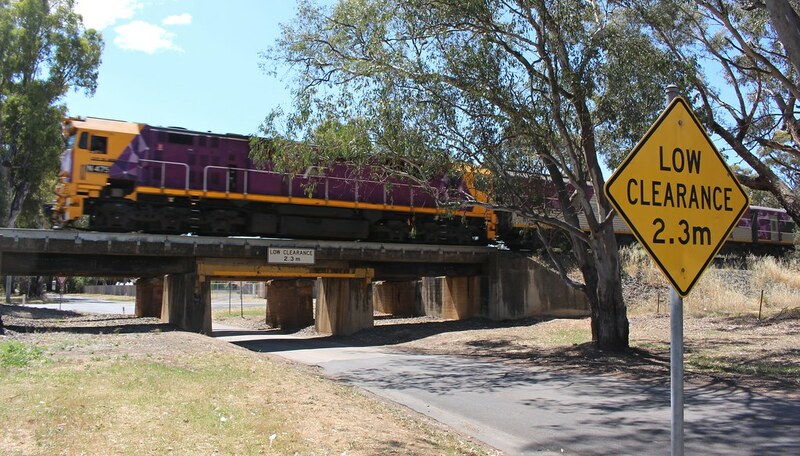 The sixth river crossing is the two track dual gauge railway line from Sunshine via the Bunbury Street tunnel, taking predominantly freight as well as passenger trains from Sydney, Adelaide and Albury — 1 track each way. What’s the peak capacity of these rail lines? Once the Regional Rail Link is opened, that will take up to 20 V/Line trains per hour, with about a capacity around 300 people each = 6000. The slots on the suburban lines can then all be taken by suburban trains. These tracks are signalled for trains every 2 minutes, but the general rule of thumb is to use 80% of the theoretical capacity, so 2 tracks x 24 trains = 48 trains per hour. Even that At an average “desirable” figure of 800 per train = 38,400 people per hour. 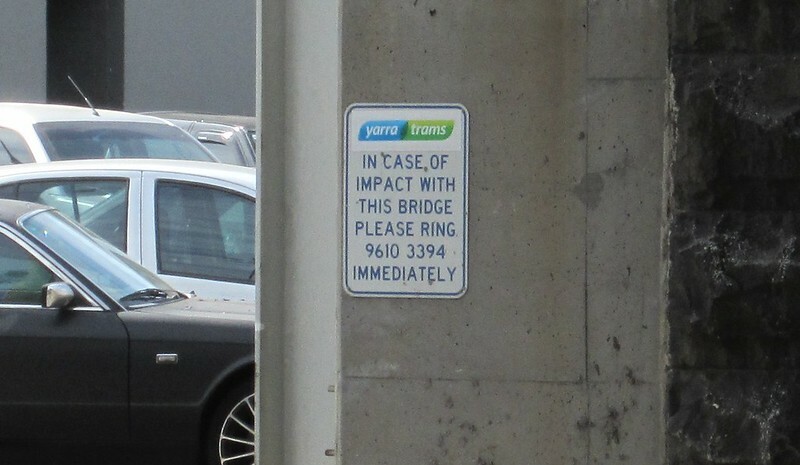 A theoretical total then on the three tracks of 44,400 people per hour, or about double all of the road capacity (and not counting the trains using the Bunbury Street tunnel, which bring in more people on a small number of additional trains). But it’s needed for freight! Freight? If freight is such a priority, why are there no truck-only lanes on the existing motorways, to ensure individuals in cars don’t delay freight? 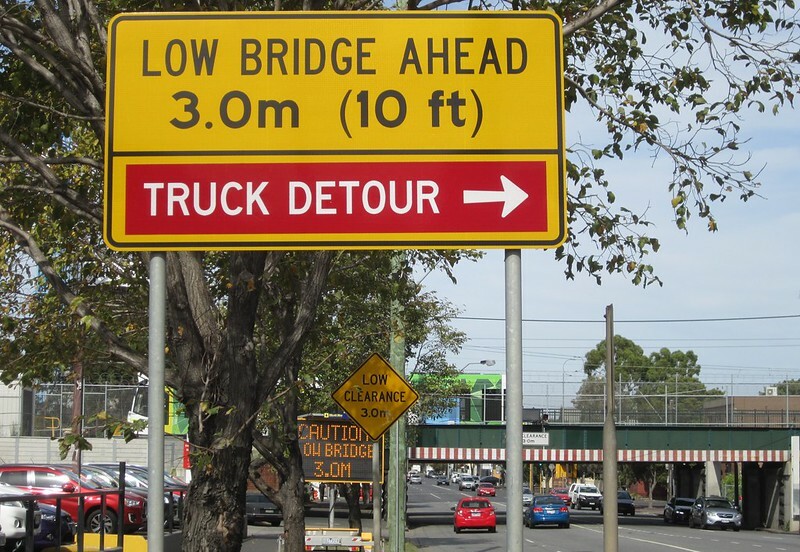 On the contrary, some of the freeways have lanes where trucks are specifically banned. If freight is such a priority, why is there no proposal to build this new tunnel as a freight-only route? And as I’ve noted before, if freight is a priority, and we’re not just building another road to bring more cars into the CBD, why did the original artist impressions clearly show cars heading to the CBD? The general consensus seems to be that this tunnel won’t be fully funded by government due to the huge cost. Private enterprise would have to be involved, and they would inevitably push for it to be built with city exits — to encourage car commuters onto it to generate more toll revenue — which would result in more cars clogging up the inner-north and CBD. Marvellous. Road capacity can be increased by widening existing roads and bridges, and/or by building the $10 billion road tunnel. Like every motorway before it, it will inevitably fill with cars, increasing overall road traffic. 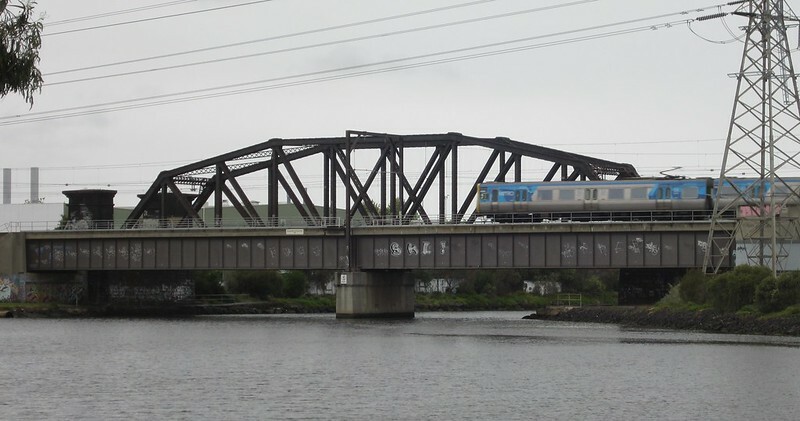 Rail capacity can be increased by improving rail operations, upgrading signalling (to improve track capacity), extending train lengths (particularly V/Line, but also in the longer term, metropolitan trains), new more efficient designs of trains (without intermediate cabs, for instance), and adding tracks (anything up to and including the proposed $5 billion metro rail tunnel). But as the figures above indicate, it’s a lot more efficient to move large numbers of people by rail. Importantly, existing rail capacity can be harnessed by giving outer-suburban residents better access to stations at the start (and end, if necessary) of their trips: in particular, better more frequent connecting buses, better walking and bike facilities at stations, and of course more frequent trains all day (minimising wait times no matter when you want to travel). Like other recent public transport upgrades, the more you improve the service, the more passengers you get, moving more people more efficiently and sustainably than in cars. As I said last week: Do we want the next surge in travel growth in Melbourne to be in private vehicles, or sustainable modes such as public transport, walking and cycling? Which should we be aiming for? 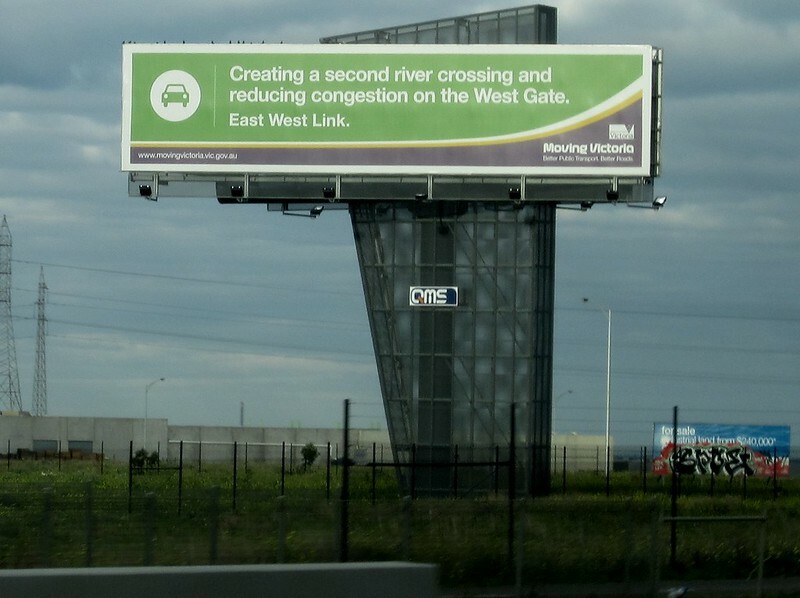 Update 2/7/2014: Added image of government advertising for the “second river crossing”. 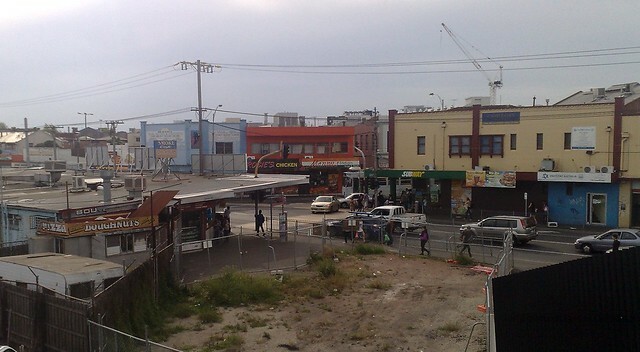 The Footscray station pedestrian bridge opened earlier this year. As noted in this Age article, part of it will have to be demolished to cater for the Regional Fast Rail project (even though the RFR project was funded before the bridge was built… hello, forward planning). 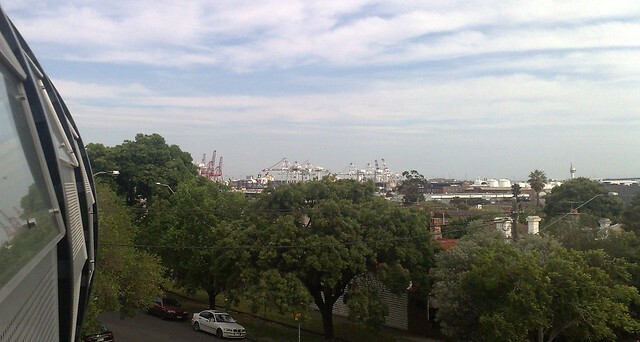 Anyway, there are some great views from the top of the bridge. Here are some of them. 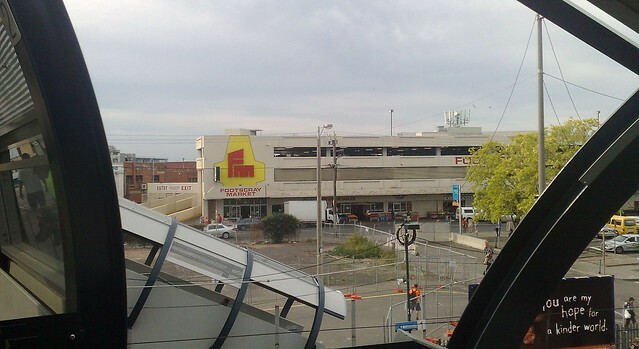 View to the doughnut van and the shops. 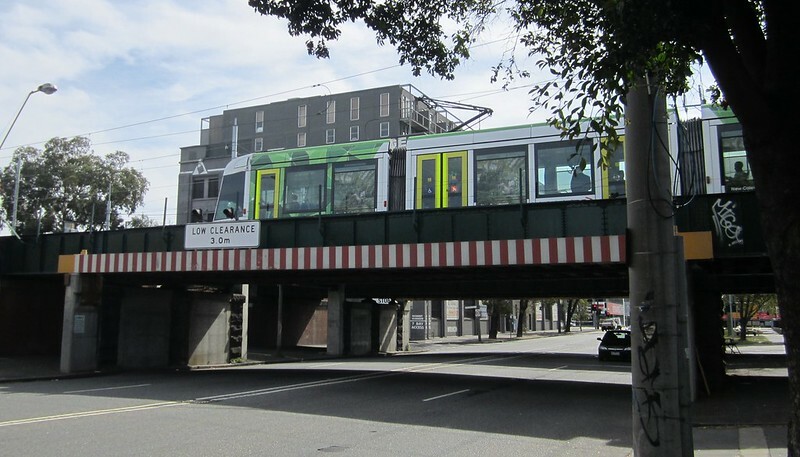 The crane is a sign of things to come — Footscray is one of six suburban Central Activities Districts, and is likely to be heavily developed in coming years. The first highrise buildings are going up already. And the empty land in the foreground will make way for the new platforms and station plaza — though I’ve been assured the doughnut vendor will be looked after. I’m terribly sorry: the one I took of the view to Franco Cozzo didn’t come out. Will go back and do it again soon.